This book will be especially useful for project managers but it's also intended for other JIRA users, including developers, and any other industry besides software development, who would like to leverage JIRA&apos;s powerful task management and workflow features to better manage their business processes. Atlassian JIRA is an enterprise-issue tracker system. One of its key strengths is its ability to adapt to the needs of the organization, ranging from building Atlassian application interfaces to providing a platform for add-ons to extend JIRA's capabilities. 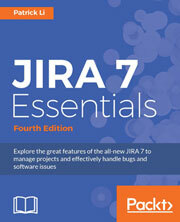 JIRA 7 Essentials, now in its fourth edition, provides a comprehensive explanation covering all major components of JIRA 7, which includes JIRA Software, JIRA Core, and JIRA Service Works. The book starts by explaining how to plan and set up a new JIRA 7 instance from scratch for production use before moving on to the more key features such as e-mails, workflows, business processes, and so on. Then you will understand JIRA's data hierarchy and how to design and work with projects in JIRA. Issues being the corner stone of using JIRA, you will gain a deep understanding of issues and their purpose. Then you will be introduced to fields and how to use custom fields for more effective data collections. You will then learn to create new screens from scratch and customize it to suit your needs. The book then covers workflows and business processes, and you will also be able to set up both incoming and outgoing mail servers to work with e-mails. Towards the end, we explain JIRA's security model and introduce you to one of JIRA&apos;s new add-ons: JIRA Service Desk, which allows you to run JIRA as a computer support portal. This is a comprehensive, practical guide on using JIRA to efficiently manage all your projects. It provides clear, step-by-step explanations, and shows how you can use the various features of JIRA to manage your projects more efficiently.